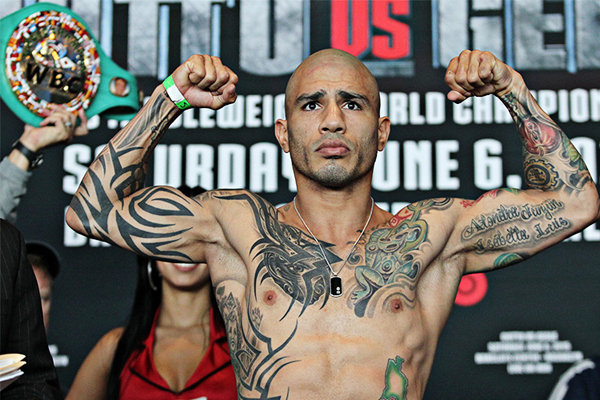 Last week, Puerto Rican boxing legend Miguel Cotto announced that he was splitting with promoters Roc Nation. It was natural to wonder what could be next for the 36-year-old Cotto, especially since he has been inactive for over a year, since losing the lineal middleweight crown to Saul Alvarez in November 2015. But on Wednesday, Cotto announced a new, multi-fight deal with Golden Boy. He will return to action on August 26 in Carson, California, against Japanese brawler Yoshihiro Kamegai. The vacant WBO, super welterweight belt will be on the line. That is a pretty meaningless belt, even by alphabet-soup standards. Kamegai, although a crowd-friendly fighter, is hardly a credible world-title contender. Heck, after over 18 months on the couch, Cotto isn’t really a credible world title contender anymore, despite his resume. This fight will be interesting solely because it features one of the biggest stars of this century–even if it is an aged version. If Cotto is still anything like the fighter he was when he stopped Sergio Martinez in June 2014, Kamegai should be a perfect opponent for him. Kamegai is an aggressive, come-forward fighter who has absorbed significant punishment over the years, in wars against fighters like Jesus Soto Karass and Robert Guerrero. Even at a relatively advanced age, a smart ring general and sharp counter puncher like Cotto should be able to look very good against him. But Cotto has taken his own share of heavy abuse. He was battered by Manny Pacquiao way back in November 2009. He took a beating against Antonio Margarito in July 2008, when Margarito was probably fighting with plaster hand wraps. Cotto struggled against Austin Trout nearly five years ago, in December 2012, losing a one-sided decision. Since that loss to Trout, he has resurrected his career, although with the benefit of some fortunate matchmaking. The version of Martinez he defeated was 40, coming off from multiple knee surgeries in recent years. Still, shrewd matchmaking has always been an important element of the boxing business. And Cotto has earned the status that allows him to employ that kind of care.